Here’s something healthy, simple and delicious you can make for breakfast every day and never get tired of: soy milk, called duyu (두유) in Korean. It’s a nutty blend of beans and nuts that has a lot of fiber and protein and is really good for you. There’s no milk in it at all, even though it look like foamy latte milk and goes down very smooth and creamy. 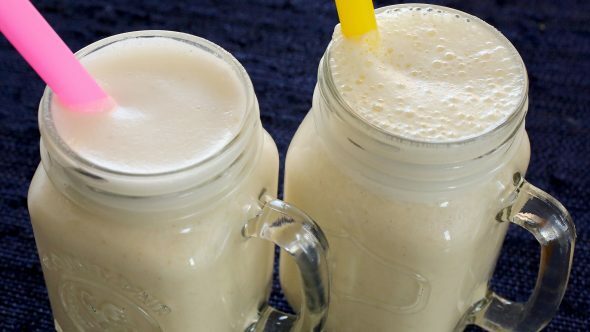 You can add whatever nuts you like to your soy milk, but I did a lot of experiments while developing this recipe and I found that cashews were perfect for it, just a little sweet and nutty. I also recommend that you don’t skip toasted sesame seeds, because they’re so flavorful and delicious. Years ago, I posted a recipe on my website for Korean soy milk noodle soup, called kong-guk-su. Today’s recipe is similar but of course there are no noodles. But if you like duyu, you’ll love kong-guk-su! Strain the beans and put them in a large bowl. Scrub the beans with your hands to remove the skins. Fill the bowl with cold water and remove any floating skins, then pour out the water. Repeat this a couple of times: scrubbing, adding water, pouring out the skins and water, until you are left with mostly skinned beans. Strain the skinned beans. It will be about 2½ cups. Put the beans in a large pot with 2 cups of water, cover, and boil for 15 minutes over medium high heat. If it boils over, cover pot halfway. 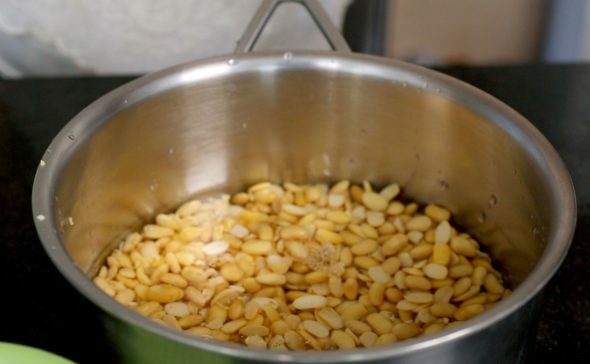 Rinse the beans in cold water and remove the remaining skins floating on the top. Strain. Put 1 cup of the beans into a blender. Freeze the leftover beans for future use. Add the cashews and sesame seeds to the blender. Add 2 cups of water and blend for 2 minutes until the mixture turns creamy. Add the remaining cup of water and the salt. Blend for 10 seconds. Transfer the soy milk to 2 large cups and serve right away. Posted on Wednesday, April 27th, 2016 at 11:18 pm. Last updated on January 8, 2019. Posted January 19th, 2019 at 1:08 am | Log in to reply. Posted February 27th, 2019 at 8:23 am | Log in to reply. You can use other nuts, such as walnuts, pine nuts, or even roasted peanuts. Posted January 10th, 2019 at 7:48 pm | Log in to reply. Posted January 13th, 2019 at 11:21 am | Log in to reply. 15 minutes cooking over medium high heat will be enough. Blend it until creamy. If you cook the beans too long, they may smell like meju (fermented soybean blocks). Posted December 9th, 2017 at 3:04 pm | Log in to reply. Can we add chia seeds to this drink? Posted October 7th, 2017 at 5:17 pm | Log in to reply. Loved the recipe and the cooking pot you used to boil the soybeans!! Can you tell me what brand it is? I would love to get one for our home. Keep up the wonderful work. Thank you. Posted April 29th, 2016 at 5:57 pm | Log in to reply. Is it safe, to cook soy beans only 15 minutes ? Some says it needs to be cooked more than 30 minutes, some says 2 or 3 hours to remove anti-trypsin. Posted July 14th, 2016 at 3:09 pm | Log in to reply. it is safe to cook soybeans for just 15 minutes if u already removed most of its skin. The phytic acid or anti nutrient lies in the skin. By soaking it preferably overnight and removing the skin, you already removed most of the phytic acid to allow for nutrient absorption. Posted April 28th, 2016 at 5:51 pm | Log in to reply. Hello Manngchi! i love your recipe! I wanna make more than 1 cup at a time as you said your friend makes amount for a week at a time. if i make that much do i have to boil than 15 minutes? Do you have any tips for me when i make a large amount? Posted April 28th, 2016 at 6:39 am | Log in to reply. Posted April 28th, 2016 at 10:32 am | Log in to reply. This recipe was originally posted on April 27, 2016 at 11:18 pm by Maangchi. It was last updated on January 8, 2019. The video was watched 1,289,930 times on YouTube & has 31,786 likes!